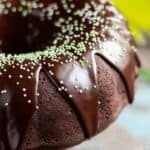 This Chocolate Stout Bundt Cake (complete with Irish Cream Glaze) would be a delicious St. Patrick’s Day treat! 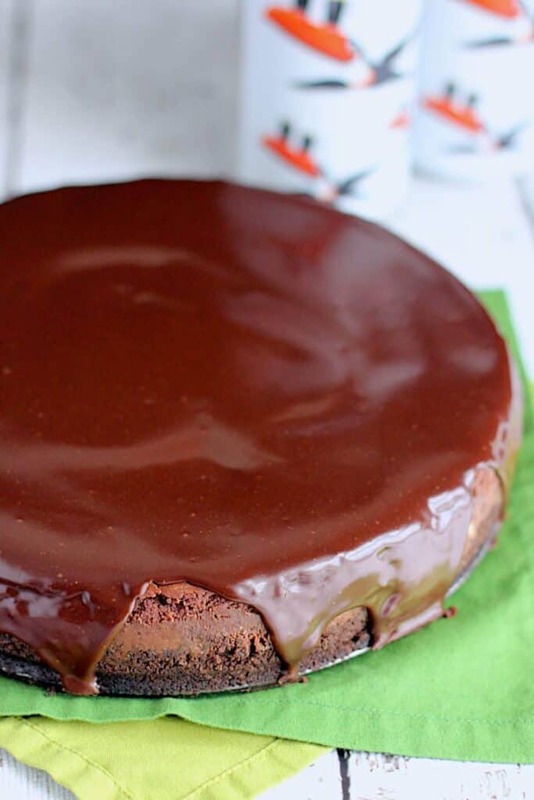 The cake is dense and very chocolatey, while the glaze is sweet and a little boozy. I added some green and white sprinkles for fun. Here’s a bit of a fun fact for you all: I’m writing this post while in Ireland! How perfect for a St. Patrick’s Day post. My husband and I are on a much needed vacation. We flew into Dublin and rented a car to drive out to Doolin (on the west coast of Ireland). We’re staying there for a few days before heading back into Dublin for a bit. Then we’re off to Liverpool for a couple of nights before taking a train up to Edinburgh. After that we’ll fly back to Dublin for a night and then come home. We only just got in yesterday, but it has been incredible thus far. The country is beautiful and green, and the food and drink have been 10/10. In very surprising beer-related news, it turns out that I actually like Guinness! Who knew? I’ll be sharing photos of our travels with you soon. 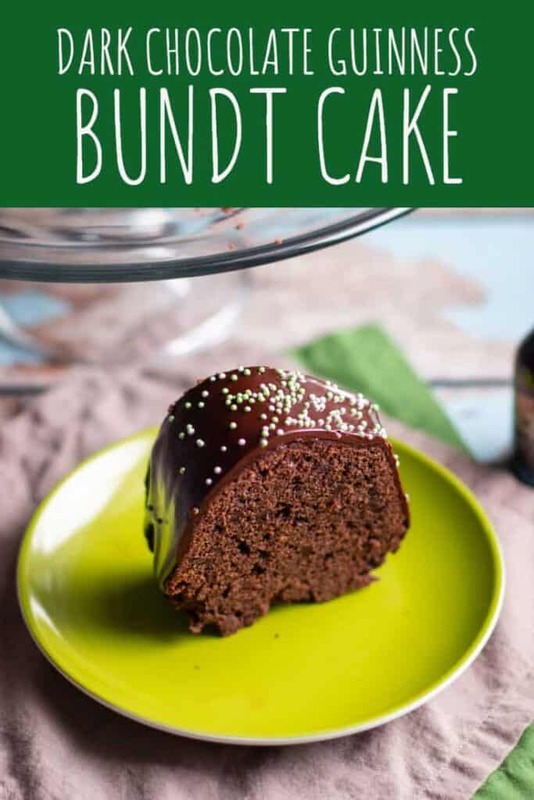 This recipe comes from the blog Handle the Heat, though it has been modified slightly to increase the overall amount of chocolate and Irish cream. Because who doesn’t want more of both of those things?? 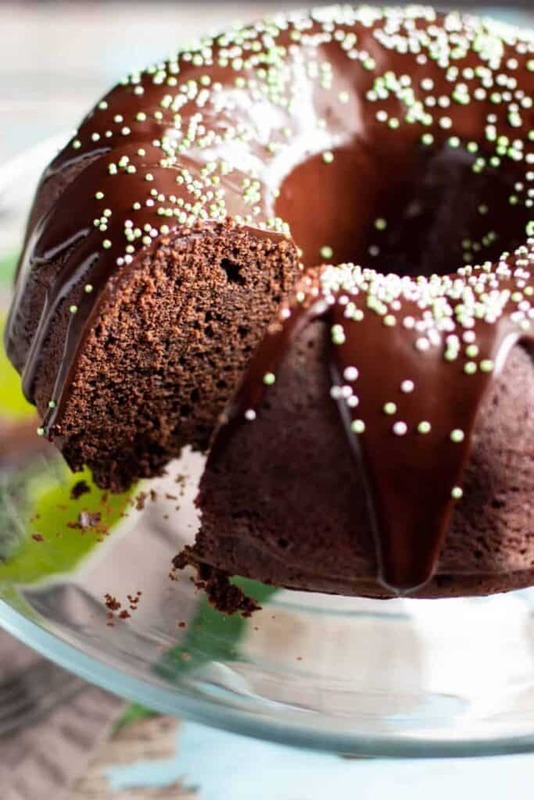 Preheat the oven to 350 degrees F. Grease a 12-cup nonstick Bundt pan and set aside (see notes). In a medium-sized bowl, whisk together the flour, baking soda, and salt. Set aside. In a small saucepan heat butter and beer over medium heat, stirring, until the butter is melted. Remove from heat and add the 12 ounces of chopped chocolate, stirring until smooth. In the bowl of a stand mixer, beat the eggs and sugars on medium-high speed, until fluffy. Beat in the melted chocolate mixture and the sour cream. Reduce speed to low and gradually mix in flour. Do not over mix. Pour the batter into the prepared pan and bake 45-55 minutes, or until a toothpick, when inserted into the center, comes mostly clean. Let the cake cool for about 20 minutes in the pan and then invert it onto a wire rack to finish cooling completely. Add the chopped chocolate and heavy cream to a medium -sized saucepan and heat over medium heat. Stir continuously. Once melted add the vanilla extract and kosher salt. Remove from the heat, add the Irish Cream, and stir. Put the sauce in the fridge for 15 minutes or so to allow it to cool a bit. Pour the glaze onto the cake and let the cake stand until the glaze firms up. Notes: pan release goop from I Am BakerThis is legit. 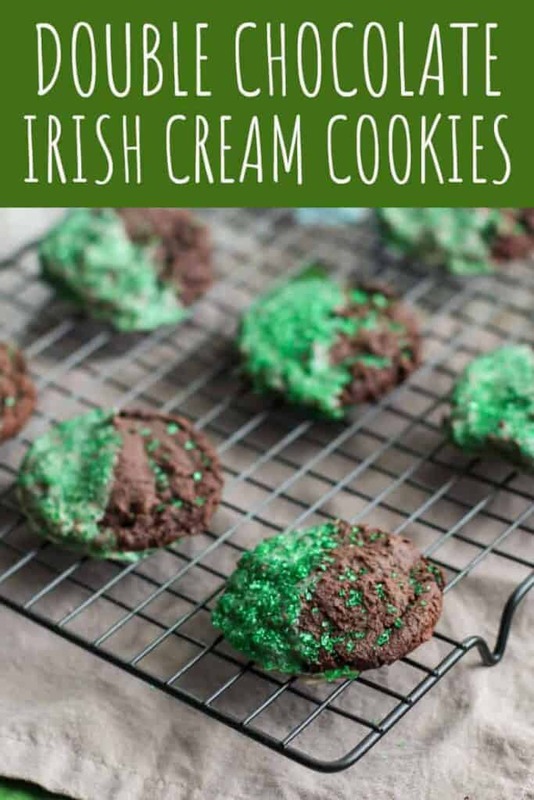 Need more St. Patrick’s Day treats? I gotcha. 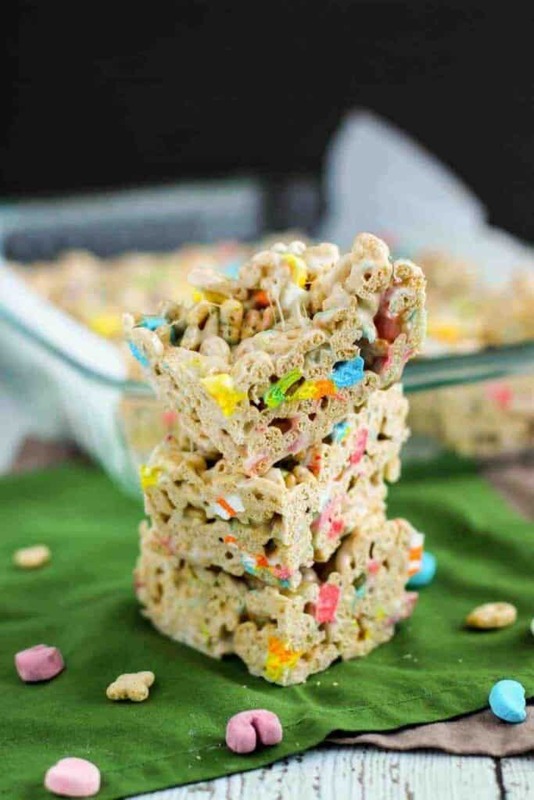 Try these Lucky Charms Marshmallow Bars if you’re short on time but still need a fun, sweet treat. Double Chocolate Irish Cream Cookies are sure to please. 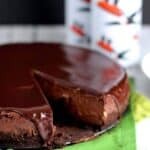 A Chocolate Guinness Cheesecake with Chocolate Whiskey Ganache requires a little planning, but is well worth it. 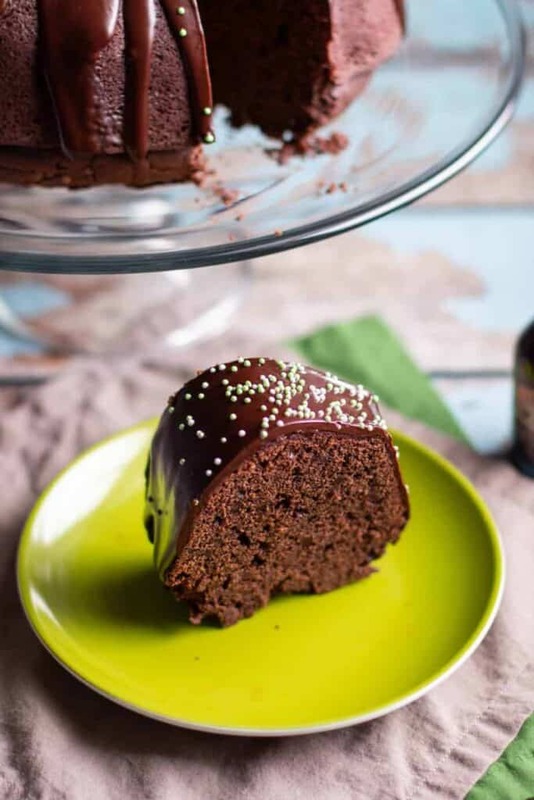 Guinness Brownies with Caramel Fudge Frosting are 10/10. 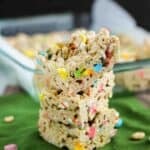 These Lucky Charms Marshmallow Bars are a fun, sweet twist on the traditional Rice Krispie treat. They’d be perfect for St. Patrick’s Day! I love cereal. Like, to an unhealthy, almost unnatural degree. It really doesn’t matter what kind of cereal, either. Super sugary children’s cereals? Yes, please. Healthier options? Also yes. I’m not exactly sure what it is that I love so much, but I can’t help myself. We don’t keep in the house for this reason. An exception was made for these bars. 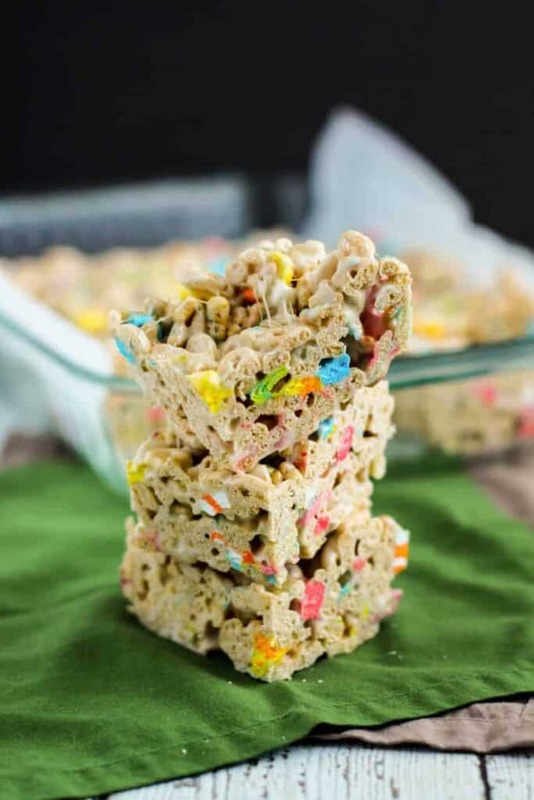 Lucky Charms (for which I have a particular affinity) replace puffed rice cereal in a traditional Rice Krispie Treat recipe to make Lucky Charms Marshmallow Bars. 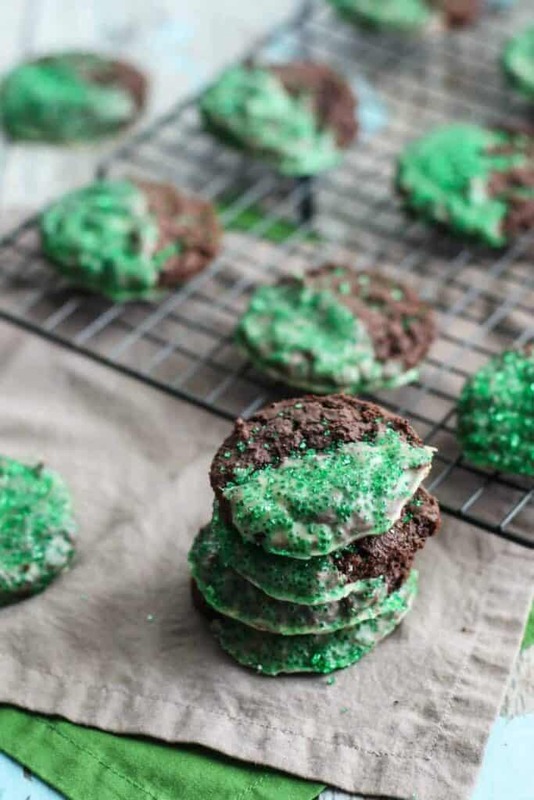 These were perfect for St. Patrick’s Day, and seriously couldn’t be easier to make. Line a 9x13-inch pan with parchment paper. Spray the parchment paper with cooking spray. Set aside. In large saucepan or pot (I used a Dutch oven), melt the butter over low heat. 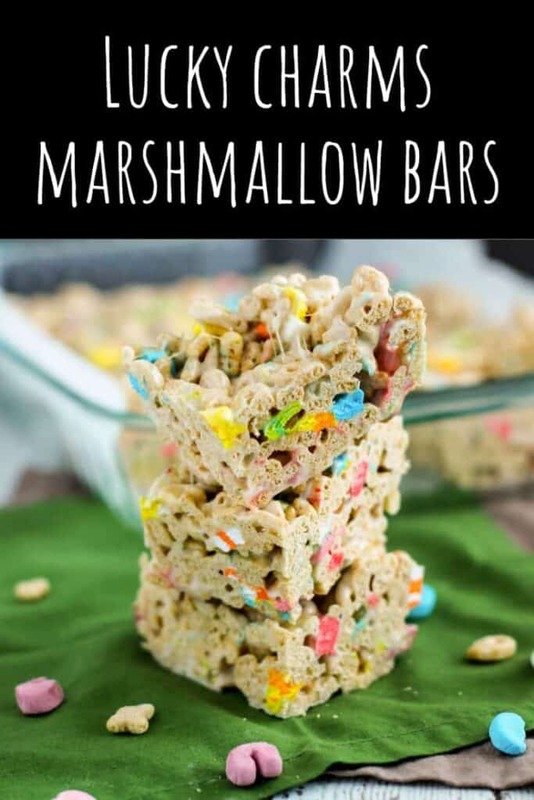 Add the marshmallows and stir until they are completely melted. Remove from heat. Add the Lucky Charms cereal. Stir until the cereal is well coated. Using buttered spatula or wax paper evenly press mixture into the prepared 9x13-inch pan. Allow the bars to cool before cutting into squares. 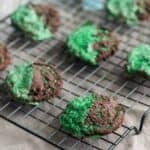 These Double Chocolate Irish Cream Cookies are soft chocolate cookies, studded with mini chocolate chips, dunked in an Irish cream glaze, and topped with green sprinkles. St. Patrick’s Day is nearly upon us! While you’ll never catch me doing a drunken bar crawl, or even drinking a Guinness (dark beer is not my jam) to celebrate the holiday, I am totally on board with holiday-appropriate boozy treats. Luckily for me (and you! ), all of the classic boozy flavors like whiskey, Guinness, and Irish cream work really well in baked goods. These Chocolate Irish Cream Cookies have double the chocolate (cocoa powder + mini chocolate chip) and double the Irish cream flavor (in the cookie dough + the glaze). Top everything with some festive AF green sprinkles, and you have yourself a tasty cookie that’s sure to please. Line a baking sheet with parchment paper and set it aside. 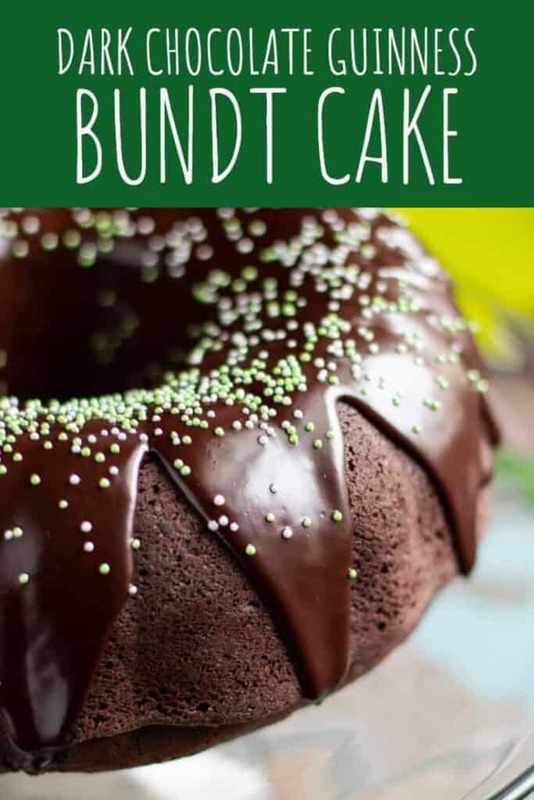 In a medium-sized bowl, whisk the flour, cocoa powder, baking soda, and salt together. Set this bowl aside. In the bowl of a stand mixer, cream the butter and sugars together for a few minutes until they are light and fluffy. Beat in the egg and add the vanilla extract and Irish cream. Little by little, add the dry ingredients to the wet, on low speed. Scrape down the sides of the bowl as necessary. Add the mini chocolate chips and turn the speed up a bit higher to incorporate them throughout the thick dough. Next, you’re going to want to scoop and chill the cookie dough. Unfortunately, the chilling is necessary. But trust me, it's worth it! Scoop and roll the cookie dough into 1.5 tbs-sized balls. Place them on the prepared cookie sheet. Cover the dough with plastic wrap and chill for at least 3 hours, and up to overnight. When slightly impatient, I've been known to put my cookie dough that requires chilling into the freezer (for 1-2 hours) instead of the fridge. I haven't run into any issues yet! When you’re ready to bake, preheat the oven to 350 degrees F and line another baking sheet with parchment paper. Move half of the dough balls over to the other cookie sheet, leaving a couple of inches between each dough ball. Bake the cookies for 9-10 minutes. Allow the cookies to cool on the cookie sheets for 5 minutes or so before removing them to a wire rack to finish cooling completely. When the cookies are cool, mix the powdered sugar and Irish cream in a bowl. Dip, dunk, or drizzle your cookies with the glaze. 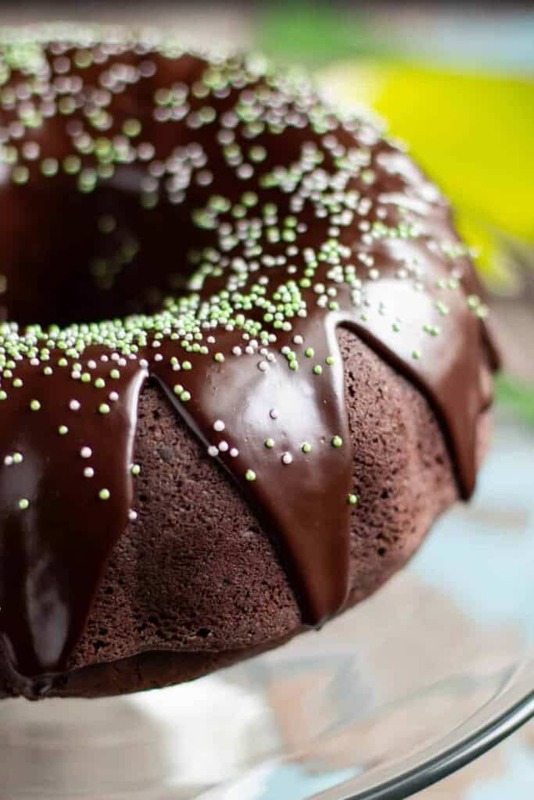 Top with green sprinkles, if you're feeling festive. Bonus: the sprinkles that I used add a bit of crunch to these otherwise soft cookies. 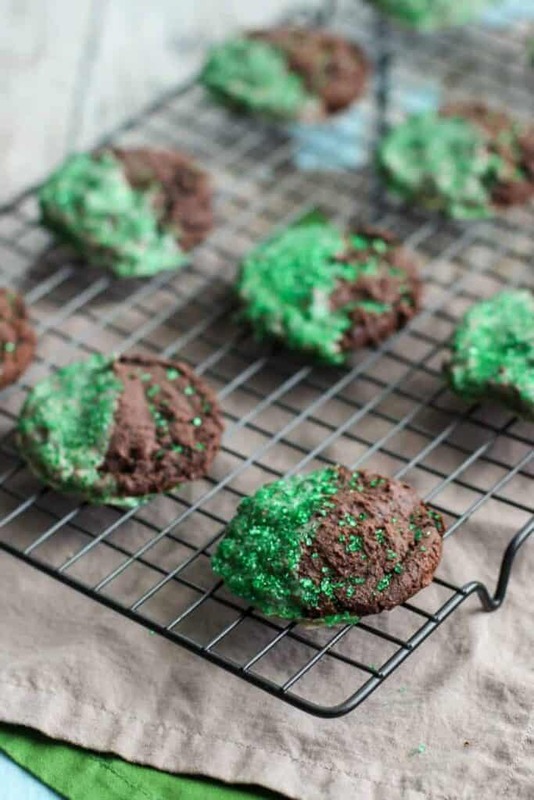 Need more boozy baked goods for St. Patrick’s Day? Try Guinness Brownies with Caramel Fudge Frosting or some Chocolate Guinness Cheesecake with Chocolate Whiskey Ganache! 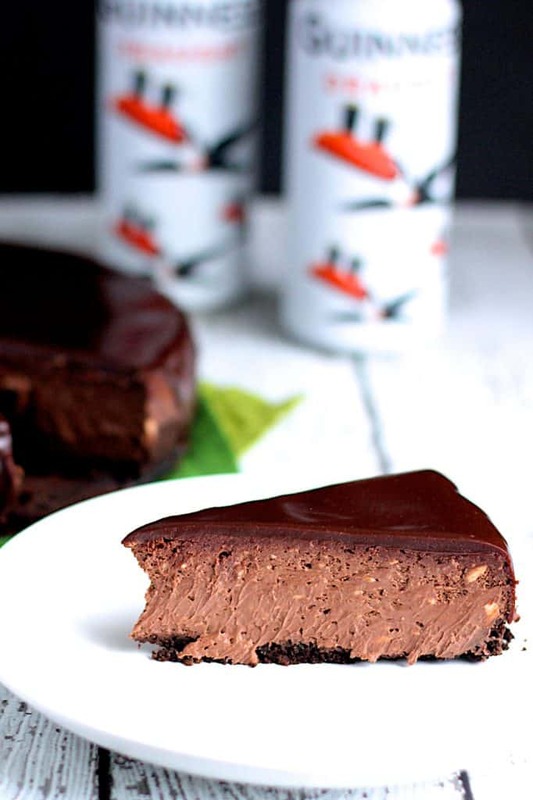 This chocolate Guinness cheesecake is rich, decadent, and slightly boozy. It is perfect for celebrating St. Patrick’s Day! I am not even the least bit Irish. I didn’t wear green today. I will not be drinking a Guinness once I get home from work. 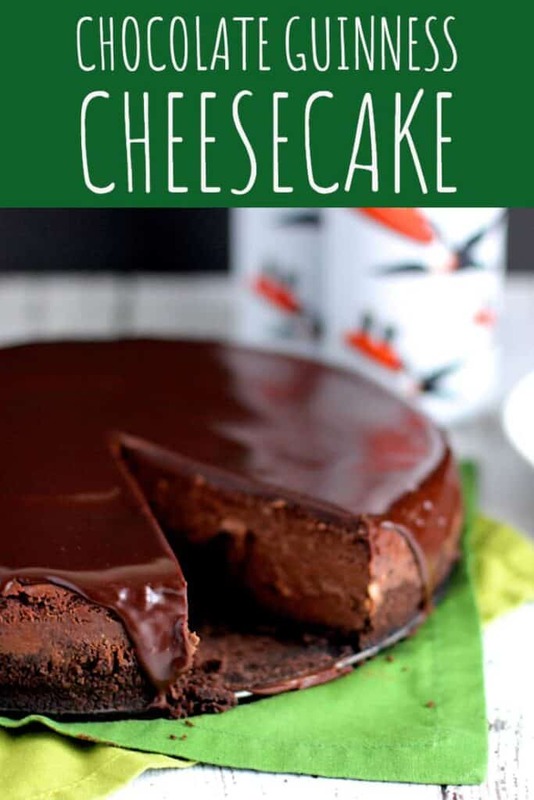 Thank goodness for this cheesecake, because otherwise I’d be failing pretty hard at St. Patrick’s Day. 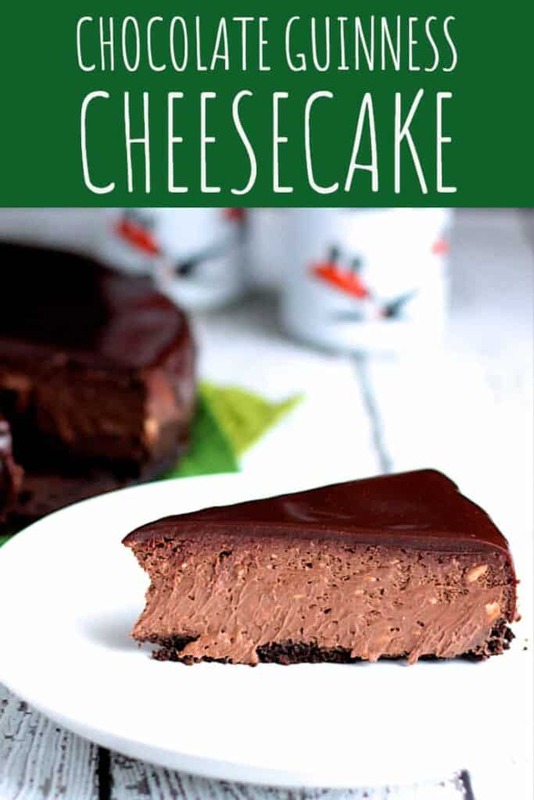 Even though I’m sharing this recipe in honor of the holiday, this cheesecake would be a winner no matter what time of year you made it. 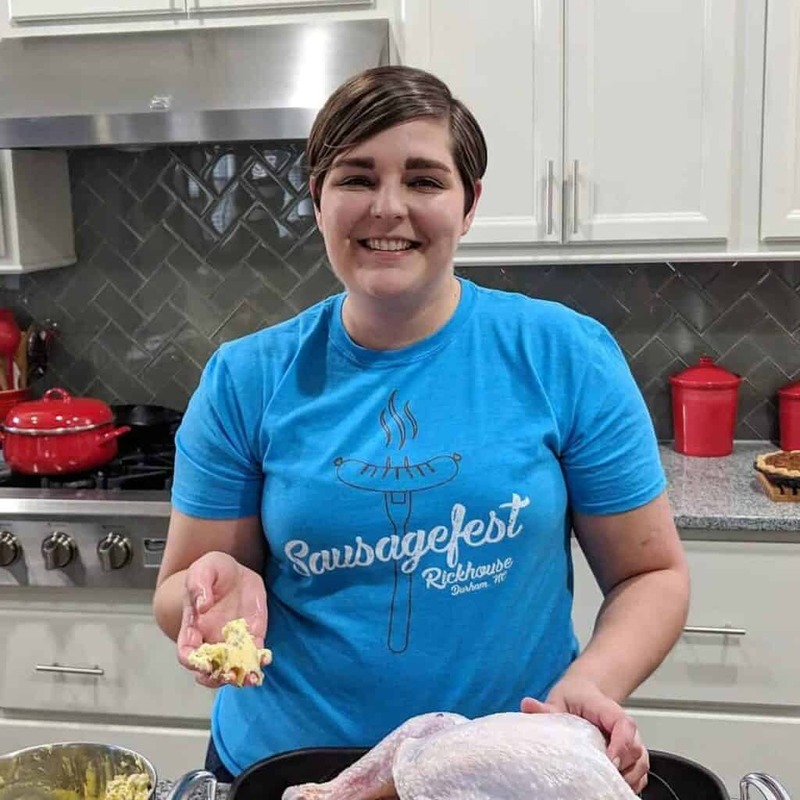 Preheat your oven to 350 degrees F. Grease a 9-inch round spring form pan with butter and set it aside. In a blender or food processor, grind the graham crackers into fine crumbs. Add the melted butter and pulse until the mixture resembles damp sand. Press the graham cracker crumbs and butter mixture into the bottom of the greased pan in an even layer. Bake for 10 minutes. Remove the pan and allow it to cool completely before adding the cheesecake batter. In the bowl of a stand mixer, cream the room temperature cream cheese on medium speed until smooth and fluffy, or about 5 minutes. Add the sugar, sour cream, eggs, vanilla, melted chocolate, and Guinness. Mix until everything is well combined. Scrape down the bowl, making sure to get the bottom, and mix again for a few more minutes. Pour the cheesecake batter over the crust. Smooth the top with a spatula. Place the cheesecake in the oven. Bake for 60 minutes. After that time, turn off the oven, crack the door slightly, and allow the cheesecake to rest in the oven for another 60 minutes. After that, remove it to a wire rack and allow it to cool completely. Cover and stash in the fridge overnight. 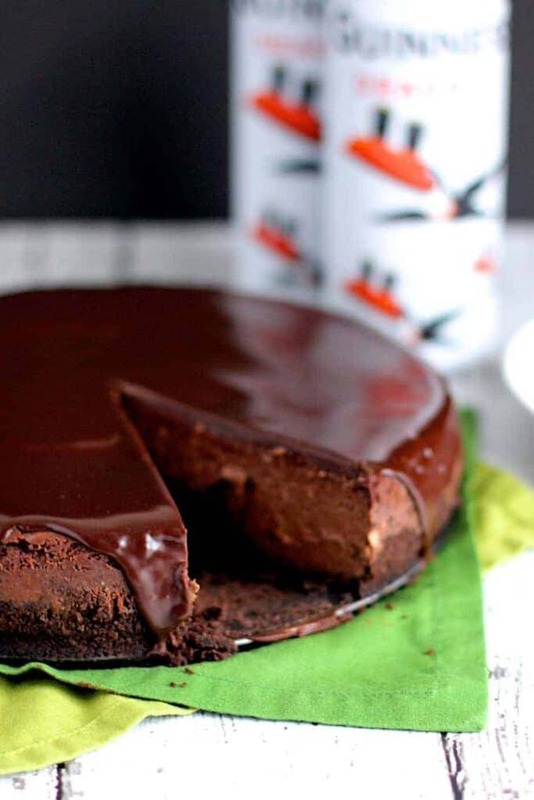 Once the cheesecake has fully cooled, make the ganache. Add the chopped chocolate and heavy cream to a microwave safe bowl. Microwave in 30 second increments until the chocolate has melted completely into the cream. Whisk to combine. Add the room temperature butter and the whiskey. Whisk to combine. Let the ganache cool and thicken slightly. Pour it on top of the cheesecake.